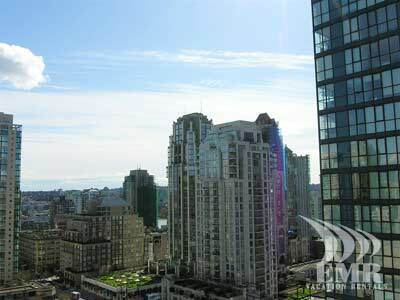 Skyview 15 is a perfect mix of location and spectacular views. 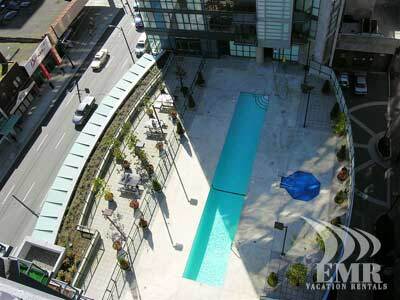 This condo's prime Vancouver accommodation setting is all you need for an excellent stay. 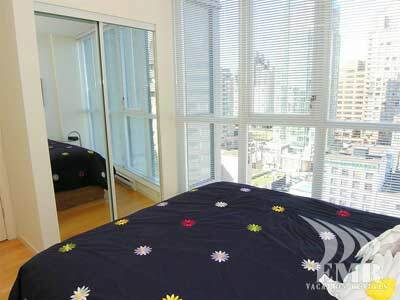 The sky view condo is a one bedroom unit in the heart of Vancouver, adjacent to the Yaletown District where you'll find lots of shops, services and entertainment venues. 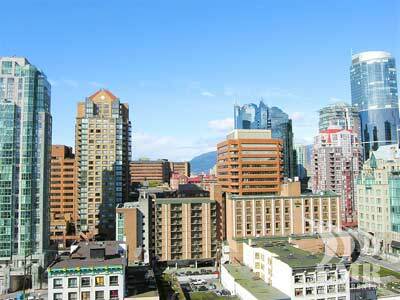 The main business district of the city of Vancouver is just a few blocks away. 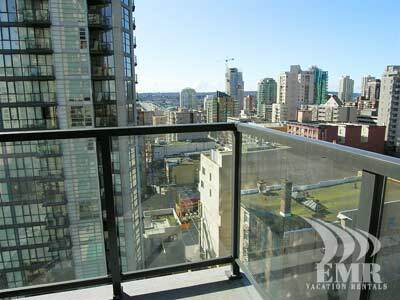 Within a very short walk is Vancouver's Theatre district, Rogers Arena, Pacific Centre Mall and the world renowned Robson Street shopping area. There's no need for a car here, with a stop right in front of your building, public transit will safely take you everywhere you want to go downtown and provide you access to most of the Lower Mainland. 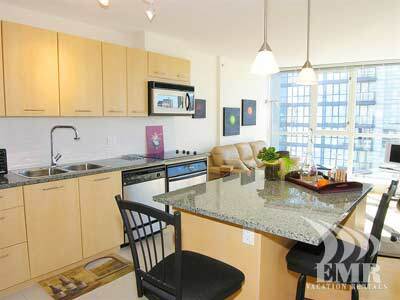 The condominium building features many convenient amenities. 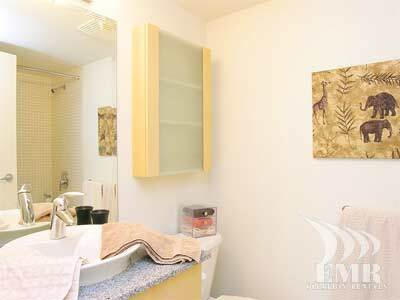 Take advantage of the hot tub, pool, sauna, steam room and large, fully equipped fitness gym. Relax with friends and play a few rounds of billiards in the games room. 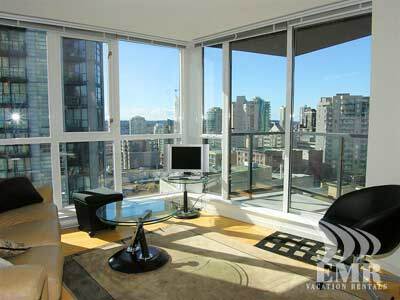 There is also high speed Internet access for the executive while working in Vancouver. We had a great stay at Brava 15. 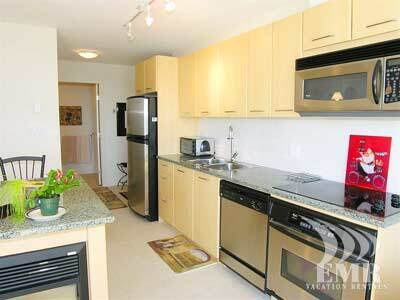 The apartment had everything you could need and more. The location was perfect. Nicole, who checked us in and out, was very sweet and made us very welcome. 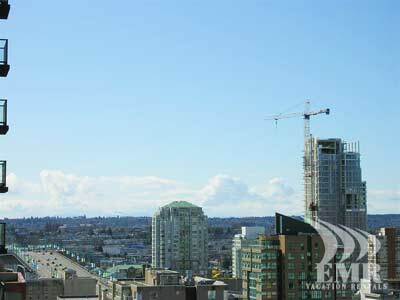 Next time we are in Vancouver we will definitely use EMR and especially Brenda who was extremely helpful. Thank you for a great holiday, wish we were still there!!!!! I was very happy. I made right choice. It was all the way AAA. We had a fantastic time coming back to the wonderful and beautiful city of Vancouver for the Winter Olympics. Unfortunately, our time went by so fast. I really want to thank Paul, Lindsay and Shannon for all their assistance in making the accommodations. 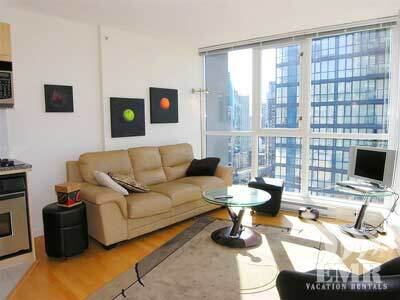 Brava 15 was a great place to stay and Yaletown was a great part of the city. Also thanks to our greeter Yen for having a lot of patience. Our flight was canceled due to snow in Dallas and we tried to fly out 3x on standby that Friday. I know this disruption probably threw off Yen's schedule. We didn't fly out until Saturday thereby losing a day but Yen was still available to greet us when we arrived. Also, she had to check us out at the early morning hour of 430 am. Thanks again Yen! Hope to be back to Van again soon! 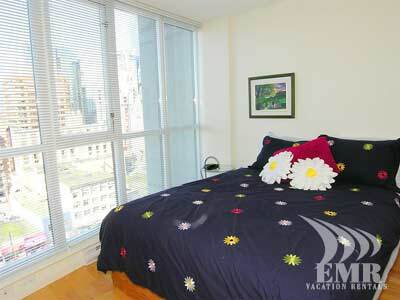 I found the flat to be nice and sweet, though the bedroom was a bit under furnished. It felt like it's been a while since anyone was in the flat and it lacked a final touch to it... bit dusty here and there... On the up side the flat is lovely, the location is superb, lively, safe and welcoming. 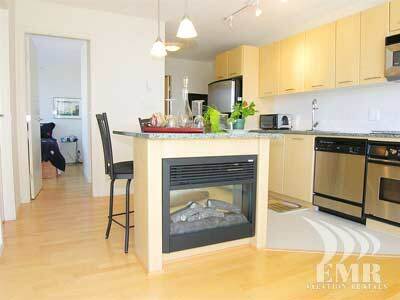 The booking was straight forward and overall I had a very positive experience. Thanks!! Very nice accommodation. However, the neighbors were loud at several times during my stay and I didn't feel I could approach them based on the agreement and warnings about doing so. It was only a few times, and it didn't overall impact my enjoyment of the accommodation. There was some confusion with the WIFI that while the greeter assured me was working, it wasn't and he simply pointed me to the apartment's manual that didn't provide enough information. At the end of the day, the WIFI was unplugged and stored in the closet. I had to spend a couple hours figuring it out myself. Lori from EMR was invaluable in helping me with my plans and I couldn't say enough about how she went the extra mile when some billing/confirmation instances occurred. Thank you, Blake and to all of your staff along the way. 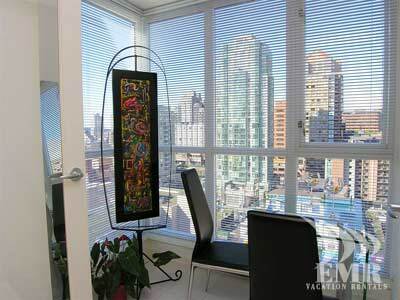 Having these condos available downtown made our trip so enjoyable! They were perfect, and am thrilled to have found your company. This will make thoughts of a return trip that much easier !